During the time America was desperately trying to gain independence from England, roller skates were making their debut in London. No one knows who invented this skate that graced a London stage performance during a show, but it is the first recorded use of roller skates (1743). Less than two decades later, John Merlin invented the first inline skate (1760). This skate boasted two metal wheels but was not super maneuverable. In fact, it’s been noted in the National Museum of Roller Skating that he actually wore them to a party and crashed into a mirror! Roller skates saw a huge change in the 1800’s, so it’s safe to say that we’ll cover just the most important information. In 1819, Petitbled patented the first roller skate design. Although this design was incredibly impressive, it lacked maneuverability. Several years later, Robert Tyers patented a skate that looked much like today’s roller blades: five wheels in single file on the bottom of a roller skate boot (1823). The rest of the 1800’s were an exciting time for roller skates: the first public roller skating rinks opened in London (1857), the quad skate was designed by James Plimpton (1863), and roller skate wheels got a serious design upgrade in the same year that the toe stop was patented (1876). In the 1880’s, America dedicated time and money to mass-producing roller skates. This time period will later be known as the roller skate’s first of many “boom” periods. Do you have a blast roller skating with your best friend or family members? Well, imagine roller skating at the Chicago Coliseum the night it opened its first public skating rink … with 7,000 other people (1902)! Seven decades later, the Olson brothers of Minnesota redesigned roller skates to make it work for ice-hockey (1979). It didn’t take but a few years after that for one of the Olson brothers to launch the company Rollerblade, Inc. In 1983, President Ronald Reagan solidified the importance of roller skating as he declared October to be National Roller Skating Month (thank you, sir)! A decade later, skaters had much more safety due to Active Brake Technology that was created and implemented. Now that you know the history of roller skating, why not head to the rink? Check out our schedule, grab some friends, and have a blast! Yikes! Blisters are the absolute worst. Not only do they hurt, but they also make roller skating unbearable. Blisters occur when skin is damaged due to friction or excess heat. If you develop a blister, there are steps you can take to treat the painful area. Thick and high socks are crucial elements to protect your feet against blisters. Socks provide extra padding. But, if they’re too low or too thin, there is not enough padding and blisters may occur. Wear thick enough socks to avoid developing blisters. If you’re one of those people who blister easily, it may be a good idea to wear blister pads on the area in question. Wearing blister pads and thick socks provide double the protection. Your skin will thank you after a fun day of roller skating! Now that your feet have the maximum protection against blisters, you’re ready to skate! Check out our hours, then head to Rainbow Rink today. Inline Skates vs. Quad Skates: Which Should I Choose? If you’ve never skated before, you’re probably wondering whether you need quad skates or inline skates. This is a common dilemma for beginners, but there’s no need to fret! The team at Rainbow Roller Rink has put together information on these two skates. Quad skates have four wheels, two wheels in the front and two wheels in the back. These skates are often the first choice for beginners, as they provide more stability and balance. If you’re a roller skate beginner or have trouble with balance, try mastering quad skates before moving onto inline skates. 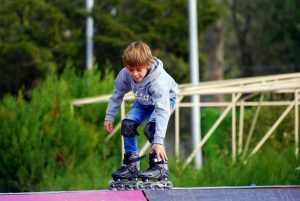 Being able to successfully skate using “four-wheelers” will sharpen basic skills needed for inline skates. If you choose to wear quad skates at Rainbow Roller Rink, you’re in good company … most of our skaters are on their four wheels playing fun games at our rink! Inline skates, commonly referred to as rollerblades, are the most common choice for outdoor skating. If you’re searching for a skate that will enable you to ride with speed, you’ll want to wear roller blades. Their design enhances your ability to speed skate. (That’s why they’re so popular in roller sports like roller hockey and roller derby.) Additionally, their maneuverability is off the charts and you can turn sharp corners with ease. Whether your skate of choice is quad or inline, practicing at Rainbow Roller Rink will sharpen your skills. Check out our hours, then skate with us today! Your students spend their Monday through Friday in the classroom, but how much of that time is truly spent getting to know their classmates? A field trip or school party to Rainbow Roller Rink is exactly what they need! They will get to know each other, which will strengthen their friendship bonds for the summer and upcoming school year. Since sitting at a desk takes up most of a students’ day, they need to take additional measures to get great exercise. But, exercise doesn’t have to be boring – exercise can be extremely fun! Bring your kids to our skating center and watch them have fun and get toned. Teachers, you do your best to incorporate fun into your students’ learning experiences. Add to the fun by taking them to Rainbow Roller Rink! With our many attractions – game zone, roller skating, and bounce zone – your students will have endless hours of fun with their classmates. A skating party at Rainbow Roller Rink isn’t only great for students. Coaches, you can bring your athletes here for an end-of-season party! Or, plan a field trip for your daycare kids. Whoever it’s for, rest assured that they will have an absolute blast. Contact us today for more information. Are you looking for ways to volunteer in your community? Since the entire month of April is National Volunteer Month, and April 15-21 is National Volunteer Week, now is the perfect time to start! Through volunteering, you are bettering yourself and your community. Put the FUN back in fundraiser by hosting an event at Rainbow Rink! Pick a charity or nonprofit to raise funds for, then invite your friends and family to get involved. Invite the whole neighborhood if you can because your group will get a percentage of the money back per admission. This is a great way to have fun and support a good cause at the same time! Parks not only beautify a city, but they also create an enjoyable pastime for kids and families. Unfortunately, some parks are subject to litter and vandalism. For National Volunteer Week, volunteer to clean up a park in your community! There are several parks in Tonawanda, NY, that you can choose from: Veterans Park, Eastern Park, and Niawanda Park are just a few. Did you know that April is also National Gardening Month? So, make it your goal to plant a garden! This can be in a local place so all city residents can benefit, or you can plant a garden in your own yard. 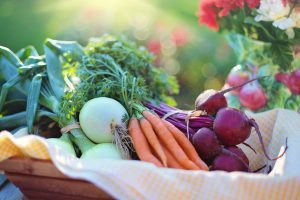 Get the kids involved and teach them about how healthy and delicious fresh produce can be. If you have any questions or want to book your fundraiser at Rainbow Rink, contact us today! Discover Our Amazing Deal on Skate Lessons at Rainbow Rink! Have you been searching for fun and affordable activities in the North Tonawanda area? We have two words for you: roller skating. If you’ve never skated before, don’t let that stop you. The team at Rainbow Rink is happy to announce that we have a Learn to Skate Class available just for you! Every Sunday from 11 am – 11:45 am, you’ll learn the basics of good roller skating with our certified skate instructors. A solid 45 minutes can transform your skating from beginner to intermediate (or from so-so to “whoa!”). And to make it better, learning to skate won’t break the bank. You pay $9 total – that covers lessons, admission, and skate rental. After the class, enjoy cruising around during our afternoon public skating session to work on your newfound skills (there’s no extra cost)! Looking for a fun after-skate activity? 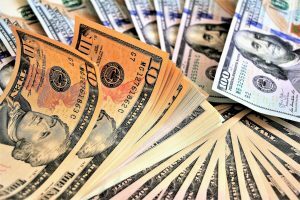 There are plenty of other fun things you can do for less than $10 including catching a matinee movie, going out for ice cream, or hosting a slip ‘n slide party. Roller skating is a great pastime that is healthy for your body and so much fun! When you skate, you’re releasing endorphins, improving your balance, toning your muscles, and contributing to your heart health. 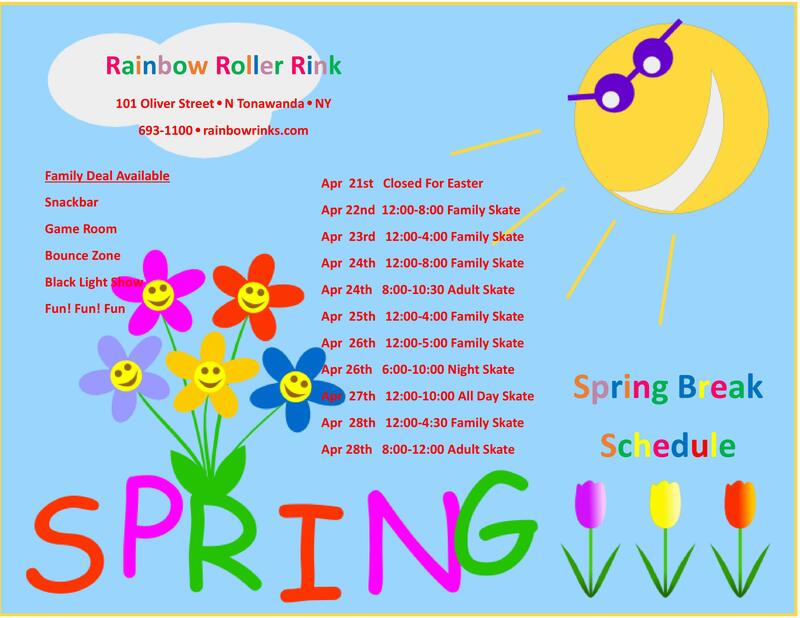 Bring the whole family or invite a couple friends to Rainbow Rink. You’ll have countless hours of fun and leave the rink feeling refreshed. The team at Rainbow Rink is excited to teach you roller skating basics at our Learn to Skate Class! Contact us today with any questions. A birthday party isn’t just any old party. It’s a celebration of someone’s life! At Rainbow Roller Rink we believe in celebrating birthdays the right way, where the only fuss is over the guest of honor. This year, throw your best birthday party yet at Rainbow! When you throw a birthday party at Rainbow, you don’t have to worry ab out getting bogged down by planning. We provide invitations, decorations, skate rentals, food and snacks, and even provide you with a party server so you can focus on taking pictures and having fun. Don’t forget the other benefits of a skating party! Your guest of honor will get a turn in the party booth, and all the guests will get game tokens, skate rentals, and unlimited fun on the skate floor. All that fun and exercise means they’ll go home to mom and dad worn out. Bedtime will be that much easier, and the other parents will be thanking you! And finally, perhaps the most important consideration when planning a kids’ birthday party: price! All our party packages are affordable, so everyone can have fun without breaking the bank. You can start simple and add on as many of our other great attractions as your plans can stand. Even a private birthday party, where you and your guests have the run of the entire skate center for two hours, works out to just $7.50 per guest. Planning a celebration for adults? We can arrange for a cash bar with private parties! No matter how big or small your birthday party, Rainbow Roller Rink is the place to throw it. 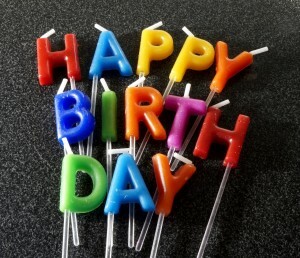 Fill out our birthday party form and let’s get started planning the greatest party ever! Skate Your Way to Fun with These Games! You already know that Rainbow Roller Rink is your North Tonawanda birthday party headquarters. Between our affordable, flexible packages and all the assistance offered by our friendly staff, you’ll never have an easier time celebrating such an important event! Since the skating rink includes its own activities, there’s no need to stress yourself worrying about how to entertain all those kids, but if you want to add more fun, look no further. Check out these skating games for your next party! Relay Races. This is just like a regular relay race, except on skates. Kids can go faster on skates than running, so the races won’t take as long, and you can host an entire tournament if you like. Consider decorating your own batons, since it’s a birthday party! Four Corners. Divide the rink up into four corners, labeled one, two, three, and four. Have the DJ play music while everyone skates as normal. The DJ should stop the music randomly, at which time everyone had to skate to a corner of their choice. Then pull a number out of a hat, or select one randomly. Whoever’s in that corner is out! The last person left in the rink wins. Skate Chain. For this fun amoeba-like game, everyone lines up with their hands on the waist of the person in front of them. Skate around the rink, getting gradually faster, and see how long you can keep the chain together! A skating party is always a blast at Rainbow Roller Rink. Contact us today and let’s get started planning yours! To celebrate the month of love, we put together a list of reasons why we love roller skating so much! 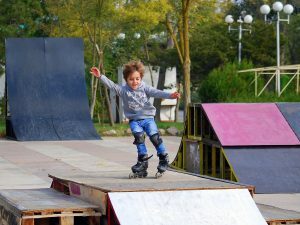 From its ability to put a smile on everyone’s face to being a fun birthday party activity, there’s no surprise that roller skating is the best activity in the world. Discover the reasons why we love roller skating … and afterward, come try it for yourself! So many activities revolve around the weather – ice skating, swimming, and hiking, to name a few. It can be frustrating to plan a family-friendly activity and the weather rains on your plans (literally). So beat Mother Nature’s dominance by choosing a weather-friendly activity that you can enjoy all year long: roller skating! We are open every season of the year! This fun activity is a great way to brighten someone’s day. Did your little one have a tough day at school? Did you have a tough day at work? Come to the rink! Moms, dads, grandparents, kids, and everyone in between are welcome at the rink. We’re positive that you’ll leave with a smile on your face. Have you been searching for an activity that’s fun and provides great exercise? Roller skating is the answer. It’s easy on the joints, provides a legitimate workout, and is an absolute blast! Visit the skating rink today for a workout that doesn’t require dumbbells and a treadmill. 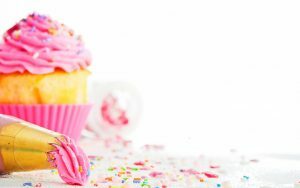 Are you looking for a great venue for a birthday party in North Tonawanda? Look no further than Rainbow Roller Rink. 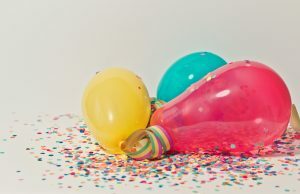 Our birthday party packages include pizza, soda, popcorn, skate rentals, and so much more for all the birthday guests! Your birthday boy will love celebrating his birthday at the skating rink. If you’re interested in booking a birthday party at our skating rink, contact us today! 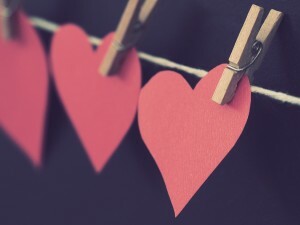 Most people think of Valentine’s Day as a standard thing: you get dressed up, you go out to dinner at the same fancy restaurant as everybody else, you exchange the same fancy but meaningless trinkets as everybody else. Repeat next year. But have you considered doing something that’s actually fun? Pro: It’s Inexpensive. Both of you can come out to skate, including skate rentals, for under $20 during our open skate hours. Con: You’ll have so much money leftover for gifts that your date may expect you to really deliver. Pro: It’s Unique. While everybody else is squashing into crowded tables at busy restaurants, you and your date will be enjoying a fun, nostalgic date that also happens to be a great way to get a little exercise. Con: Your date may expect this same level of creativity all the time. Whether that’s a problem depends on how creative you are! Pro: It’s a Good Excuse to Hold Hands. Con: Sorry, we can’t think of why this would be a bad thing. So there you have it! Grab your date, put on your fanciest skate-appropriate socks, share a soda at our concession stand, and ask the DJ at Rainbow Roller Rink to play your song so you two can enjoy a couple’s skate. We can’t wait to see you for the best Valentine’s Day ever!